I may or may not have confessed this before, but side dishes are hard for me. If I’m making a big meal, I don’t want to spend a lot of time/energy/resources/money/dirty dishes on a fancy side dish. If I’m making something super simple, there’s usually a good reason behind it (I’m sick/tired/not in a cooking mood/wishing everyone would find a way to feed themselves). So if we’re going to have something besides a simple green salad, fruit, baked potatoes, steamed veggies, or frozen fries, it’s gotta be a) easy and b) requiring very little of my time and energy. And clean dishes. In case you haven’t noticed, I reaaaaally don’t like to do dishes. So yes, this side dish does involve a frying pan, but it also involves a lot of shortcuts and make-ahead options. You’ll need a 12-ounce bag of fresh or frozen veggies (I used a fresh stir-fry mix from the produce department, but I really, really, really like just straight up broccoli), fresh ginger and garlic, about half of a small red onion, honey, beef broth, Sriracha (optional, but not in my world), sesame oil, soy sauce, sesame seeds, and some kosher salt. Measure out 1/4 cup of beef broth (I just used 1/4 cup water with 1/4 teaspoon beef base dissolved in it) and whisk in 1 teaspoon sesame oil, 1/4-1/2 teaspoon Sriracha, 1 tablespoon honey, and 3 tablespoons soy sauce. Set it aside. 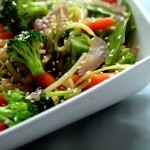 You can also whip this up ahead of time and refrigerate it until you’re ready to stir-fry your veggies. Heat 2 tablespoons of canola oil in a large non-stick skillet or wok over medium-high heat. When it’s hot and shimmery, add the onion, ginger, and garlic in that order. Stir fry it for about 20 seconds and then add your veggies. Stir fry for 2-3 minutes or until the veggies are starting to brighten and darken in color but aren’t over cooked. Whisk together your sauce ingredients and then drizzle the sauce over the vegetables. Cook for another 2-3 minutes, stirring frequently. Transfer to a serving dish and drizzle with another teaspoon of sesame oil, sprinkle with sesame seeds, and serve immediately. This comes together in just minutes, and is perfect for busy weeknights. Whisk together the beef broth, soy sauce, Sriracha, 1 teaspoon sesame oil, and honey. Set aside. Heat 2 tablespoons canola oil in a large non-stick skillet or wok over medium-high heat. When very hot, add the onions, ginger, and garlic in that order and stir fry for about 20 seconds. Add the veggies and stir fry for 2-3 minutes or until the veggies are dark and bright but still crisp. Add the sauce and stir fry for another 2-3 minutes or until the veggies are tender-crisp. Transfer to a serving dish and drizzle with another 1/2-1 teaspoon sesame oil and sprinkle with kosher salt to taste and sesame seeds. Serves 4-6. *Variation: To make this a meal, add thin slices of steak or chicken breast before you add the onions. I’m with you about the whole side-dish problem. In fact, I am pretty sure that in my world, I would add chicken to this and transform it from side dish to main dish and call it good. And not that I’m counting or anything, but that’s two recipes in a row now without cilantro! Well at least I’m not the only one who immediately thought about how yummy this would be with chicken! Perfect for Lunar New Year’s celebrations as well. I will be making this. Mmmm – this sounds great AND easy! (My two pre-requisites! 🙂 Always looking for new ways to serve broccoli since my son eats it like there’s no tomorrow! To the olive oil I add some fresh minced garlic, chili powder and Montreal steak seasoning (fancy salt and pepper). (adapted from Rachael Ray). Delicious! Also works great with green beans. This sounds lovely! Is the chili sauce in the picture “Sriracha sauce”? I saw another recipe that called for that sauce recently and couldn’t find it in the grocery store. Yep! Check in the Asian foods section as well as the sauces, ketchups, etc., because it’s become so popular and mainstream that I’ve seen it there a few times. Yum! I would have to add chicken though, it just doesn’t have enough protein for me without. I bet just adding it to this would be just perfect for a full meal for me. As a side, this is great! Great side dish! I pinned it to make later. Ohh the Roster Sauce…spicy spicy! Love it! I love stir fry! Such a good way to get your veggies–love the addition of the Sirarcha sauce! It is funny, but that is what I have planned for dinner tonight, with chicken ofcourse. YUM, YUM! This is great. I would love to see more meatless recipes. I try to cook vegetarian a couple times a week. Looks wonderful. We love stir fry. Question about the Sriracha sauce … I’ve picked it up a few times in the store but never bought it. How much heat does it add? Love to enhance the taste of things but a little heat goes a long way with me. Thanks. Yum! I am SO making this tonight for me, and for a sick person I’m bringing dinner to. Thank you Kate! You never disappoint =). My favorite recipe from Cooks is their recipe for Stir-Fried Shrimp with Snow Peas and Red Bell Peppers in Hot and sour Sauce. 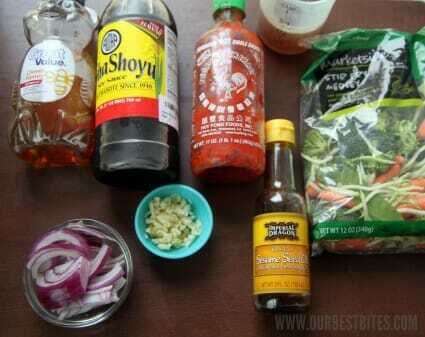 I love stirfry! This would be great with fried rice! Thanks! I get in a side dish rut too! But I think you just solved my side dish dilemma for tonight’s dinner! I am making yall’s Orange Teriyaki Salmon tonight for dinner and I think these veggies would be the perfect accompaniment! Just made this (with a few slight changes) and served it with the Orange Teriyaki Salmon and some wild rice. It was absolutely wonderful and something I will defiantly make again! I too hate making side dishes… it’s usually mashed potatoes, baked potatoes, fries, or a canned (gasp in horror) veggie. (notice the potatoe theme… it’s hard to escape in Idaho). This is a great idea! 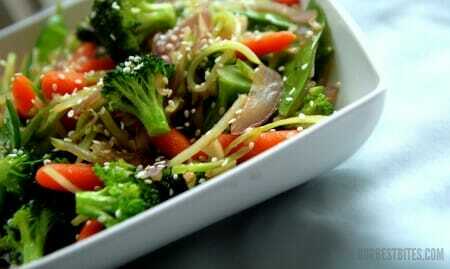 We love stir fry as it’s a quick and nutritious meal! Thanks! Hi–love the suggestions here! My handsome son and his beautiful girlfriend have decided to get married in early April. WooHoo and Yikes, all at the same time. She has decided to do finger foods since their venue (City/County Bldg in SLC) doesn’t allow an open flame. She has a few good ideas (and a restricted budget, since she is paying for his herself), and I was wondering if you have some “classy” (her term) ideas for such an event. Thanks! Yum. This sounds much more flavorful than my usual stir-fry! I’m a broccoli fan too – I could eat it nearly every day. We made this tonight…so good! We doubled the sauce since we added shrimp and lo mein as well. i will be making this again. Thank you! I wanted to add that I used a white onion instead of a red and I also added a cilantro boullion cube to the dish…next time i might add two cilantro boullion cubes and maybe a little more garlic so it will have a stronger flavor…I think this was needed since I also added the noodles and shrimp. Can bouillon and water always be substituted for broth (chicken or beef)? What is the difference? looks yum! You use Aloha Shoyu!!! Da Best kind of shoyu! I made this last night and it was soooooo yummy! Thanks for sharing the recipe. I added the chicken and served it over rice for a main dish and loved it. Where did you buy that stir-fry mix? It looks like it has the perfect veggies for my tastes! It’s so nice to see a vegetarian option here (I will leave out the beef broth or substitute vegetable broth for beef). Thanks for including this. It looks delicious! I bet it would be great with tofu as well! YUM! Love the chili sauce too! Indescribably delicious! I forgot to buy honey, but it still came out superb ! I have the same problem with doing “side dishes” with just the two of us. I have to ask – what brand of beef base do you use? Orrington Farms (I get it at Kroger) changed their formula and I’m really happy with it compared to the old way. But, I’m still looking for something that isn’t quite as sodium-heavy. I just use McCormick beef base. One thing that makes me feel better about this sauce is that a) the veggies don’t absorb a lot of it and b) it’s not thick, so it doesn’t coat the veggies–we always have lots and lots of sauce left over afterwards. If you’re serving it over rice or noodles, I think the sodium content is definitely more of a concern because they’ll soak it up, you know? That said, you could always just use water or diluted broth and then season it to taste. Fantastic. Just what I was looking for on this meatless Monday. I’ll be serving with brown basmati rice and some veggie eggrolls that I made a few weeks ago and froze. Thanks. I’m back to say that this is a new favorite. We loved it so much last Monday night that I made it again a few nights later with some chicken and shrimp. Thanks! Hey Kate, I made this tonight and thought it was great. But I’ve got a question for you: in your recipe you say to use sesame oil, but in the picture you have sesame seed oil. I believe they’re different oils with sesame seed oil being much more potent. Just wondering which you use. Thanks! I needed to make room in my freezer and had a bunch of frozen veggies to stir fry, and this was the perfect sauce! So delicious and easy, thank you!! !